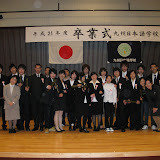 We hold a graduation ceremony on 16th Mar. 22 students left our school this year.Half of students enter university in Tokyo,Osaka and Nagoya and the other students enter University in Kagoshima. We wish everyone could be happy in their future!